I realize that these pretzels don’t look like much. In fact, they look like… pretzels. Plain old pretzels. Let me back up a minute. Confession time. I don’t really… care about pretzels at all. I don’t NOT like them, but I have no desire to snack on pretzels, ever. They are way too boring and I’d rather choose something more delicious, like tortilla chips and guac. It cracks me up because right now, Max would do anything for a pretzel. He snacks on them daily and they are one of his favorite things. He constantly runs around screaming for pretzels. If you follow my holiday baking posts, they you know that every year, Lacy and I make whiskey pretzels. A friend gave them to her a few years ago and we have made them ever since… and it’s a miracle that anyone else even gets any because they are completely addictive. After baking, we can barely keep our hands off the sheet. They are RIDIC. My mom freaks out over these every year. Everyone who tries them thinks they are about to eat a plain old pretzel and look at me like… WHAT IS THIS DELICIOUS THING?! I changed them up just a leeeettle bit! You stir together melted butter, brown sugar, an array of spices and since I can’t let anything be, vanilla. Yep, I added vanilla to this crunchy little snack. My favorite Rodelle vanilla bean paste, to be exact. I can’t even tell you guys how many bottles of this stuff I have gone through this year. It might be my favorite ingredient in the spice cabinet. I use it constantly! The vanilla paste gives just a little hint of sweetness but also a little warmth. The combination is SO delicious. Sweet, salty, smoky and warm. Put these on a cheese plate with some roasted red peppers and you’re good to go. They also make the loveliest homemade gift! Especially for the hostess, because you can take them to the party and everyone can eat them right away. Perfect for cocktails! They pair so well with beer. Yield: 1 batch makes a ton! Preheat the oven to 300 degrees F. Line two baking sheets with parchment paper. Spread the pretzels all over both sheets. You don’t want to layer them. In a bowl, whisk together the melted butter, bourbon, sugar, vanilla paste, paprika, garlic and pepper flakes. Pour it over the pretzels and use your hands to toss everything together really well. Place the pretzels in the oven and bake for 15 minutes. Toss and bake for 10 minutes more. Remove and let cool completely on the sheets. I like to store these in mason jars or even resealable containers or bags. You can dress them up cute for gifting! I’m with you on pretzels; but these definitely look enticing! OMG, I may have to add these to my baking list this year. This weekend is THE weekend for me. It’s all going down. I LOVE pretzels (I’m with Max on this one, haha), and these look awesome. Would you feed these to max? I’m thinking the alcohol would be cooked out right? I know I’d have a tough time keeping my kids away!! Omg! 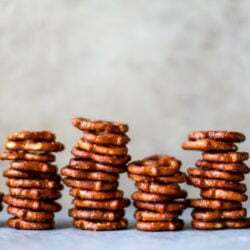 These pretzels sound so amazing! I can totally see myself eating all of them on my own, especially while watching a movie. What is this sorcery????? These look amazing and I’m with you- I normally think pretzels are too boring! Yum! Can you use vanilla extract instead if you don’t have paste? I happen to have a ton and want to use it up. Roselle Vanilla Bean Paste is so on my shopping list now! Oh wait, going to Amazon! Happy Holidays! Thanks for sharing this! Yum, yum. These look so good. And there’s bourbon! Creamy simple mashed potatoes for sure! comfort food! how do i choose???? i would say a really good mac and cheese, the kind with a crunchy top and multiple cheeses….. basically anything cheesy! I cannot find the vanilla bean paste anywhere in Chicagoland-other than ordering from Rodelle (not enough time for holiday party) any ideas where to find it? If you live near the spice house, they carry it.otherwise penzeys. I normally don’t care about any carbs but sweet ones. However, I LOVE pretzel things. They are the exception. It’s so funny that you are totally uninterested. Yeasty and salty carbs are just the best. These are to-die-for! I made these and was slightly underwhelmed. I would probably double the spices and the brown sugar. Full disclosure, I used vanilla extract not vanilla bean paste. HELP!!!! I need to make these NOW but can’t find the paste in my rural area. And there’s not enough time to get it shipped and made before Christmas. If I use vanilla extract will it be close enough?? hi! you can use extract, but vanilla beans would be a little better! can you find a whole bean? if so, use that and scrape them out. if not, 1/2 teaspoon vanilla extract! I need some more info on this paste. I hate to buy a $22 bottle as an ingredient to just one cookie, especially since I’ve never tried the cookie. How else do you use this? Yum, yum. These look so good. As well as there’s bourbon as well as Roselle Vanilla Bean Paste is so on my shopping list currently! Happy Vacations! Thanks for sharing this. Pasta! Any pasta with cheese, mushrooms and cream sauce! Just pulled these out of the oven. Hopefully, the taste will intensify as they cool. If not, I agree with Christine’s comment, and I would double the spices. I can’t taste much of anything other than pretzel. I used vanilla extract as well. I can’t imagine that is,the,big difference though. how long would you say these keep for? I made these for a New Years party and thought they were fantastic! I was a little nervous based on the other comments so I made a couple of tweaks up front: used heaping measures of the spices and brown sugar, and tossed with the pretzels in a bowl before putting them on the cookie sheets to get everything nice and coated. I did use vanilla bean paste but Nielsen Massey brand rather than rodelle because I already had it on hand. Would definitely make them again!